What Is an Auditing Assignment and the Best Tips to Write It? Assignment Help Blog What Is an Auditing Assignment and the Best Tips to Write It? How to Write a High-Scoring Auditing Assignment? Do you think, we really get high grades just by writing ordinary treditional ways? It's a fallacy some students fall for when they try to write assignments in treditional way. But the true measure of writing is in the resultant grades. 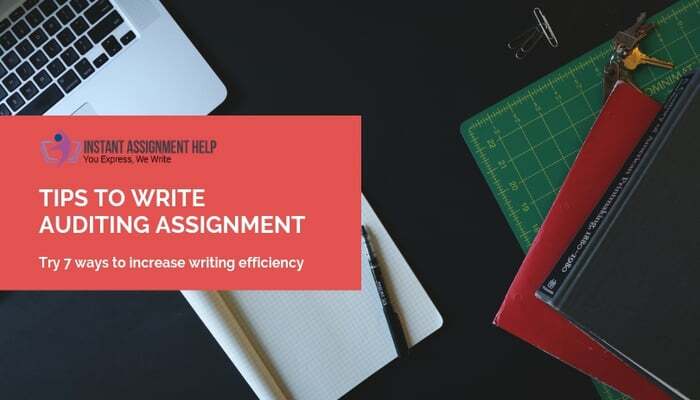 Assignment helpers of Instant Assignment Help Collective share real writing tips that allow the dumbest student to get more done with their assignments without sacrificing the integrity of their other work. Assignment writing is one of the difficult tasks that college and university students have to do. It becomes more apprehensive for them when they have to write auditing assignments. That is why, our experts have listed here the best ways to write a high-scoring auditing assignment. But before that, you should have a brief idea of auditing. So, go through the below section. Defination and What are Reaseach Topics in Auditing Assingment ? An audit is the verification of financial statements of a legal entity. It is done to provide an assurance that the financial statements are done fairly. In the field of accounting and finance, an audit plays a very important role. That’s why professors often ask to write assignments on it so that students do good research and can easily comprehend the concepts. Having said that, let’s take a look at the tips to write a high scoring auditing assignment. Be realistic so that your paper looks like you have written a subjective assignment rather than narrative essay. To save your time, you should start thinking about the assignments right when the semester begins. You can get number of ideas for your auditing assignments during the lectures. So, be attentive. Visit library or take help from any relevant tutorial. Take help from only reliable websites that have reputable authors and publishers. Try to refer articles instead of textbooks. Because articles are more up-to-date and have precise information. Write two or three sentences around which the whole paper is going to revolve. Mention all your ideas so that you don’t have to spend too much time in remembering them at the time of writing. Here comes the writing part. This is the very first part which helps you mark an impression on your readers’ mind. So, keep some things in mind. It should be very concise and only give a brief detail about the aspects that are going to be discussed later. It should clearly state that what the assignment is all about. It should not be more than 150-200 words. All paragraphs should be interrelated to each other and support the central argument. There should be logical connection between the arguments. Points should be written in such a manner that they are readable and easy to understand for the readers. It should be 1/10th of the length of the whole document. Summarize the above discussed points. Never introduce any new idea in it. Our auditing assignment help experts suggest that you should never forget to do the citation and referencing of the document. Read the tips mentioned by them, they will surely be helpful. Make sure you have mentioned all the referred sources. Ensure that you have done the referencing in the asked referencing style. Always follow the same citing and referencing style through the paper. With all these auditing assignment writing tips, you are now well aware that how you should research, and write the introduction, main body, and conclusion of your paper. Always remember that to write a good auditing assignment, you need to follow each of them carefully. Missing any on these can turn your paper into disaster.